No matter the season, an American sojourn is always a fabulous idea. From coast to coast, a litany of adventure awaits, here are a few handy hints on what to expect. First up, get your flight documents in order America’s Visa Waiver Program (VWP) allows effortless passage through US customs but to be eligible for the VWP, you’ll need to apply prior to jetting off. Unless you’re off the grid in the backend of the Appalachians, and probably even then, chances are card will be the preferred payment method. Prepaid multi-currency travel money cards are also an excellent option. Security can be fairly, shall we say, “thorough” at American airports, so get there early to avoid stress. As a general rule most hubs suggest at least three hours for international flights, and two for domestic. Wear your best socks, as you’ll need to remove your shoes, it’s still a thing there. There’s little room for dodgy humour at the American security gate, this is not the place for amateur hour. American Customs officials are particularly fastidious and sensitive to things said, so leave any travel-related quips at home. In the land of turducken, the Luther Burger, the Quadruple Bypass burger, the Fat Darrel, the Redonkadonk, and various other sandwiches that will do their darndest to tickle your tastebuds, it’s likely that your USA adventure will add a few centimetres to your waistline. Serving sizes can surprise; so if you’re not super hungry, order an “appetizer”; the US version of an entrée. Just sayin’, Americans — like any nationality — have their own etiquette and unwritten rules. The short list: doggie bags are permissible; don’t jaywalk; and make sure to tip — seriously, don’t forget that last one. The “official” line says tipping is voluntary, but with low minimum and base wages — particularly in the service industry — millions of American workers rely on tips for their livelihood. Not good at maths? a calculator is a diner’s best friend especially when it comes to calculating taxes at the end of the meal — with that in mind, stock up on a fat wad of one dollar bills. If you do yourself damage en-route, you could be up for some hefty medical bills. Best sort out your fully comprehensive travel insurance prior to flying. AUGUST — it’s when many of us head north and if we can’t do it, we dream about it. We’ve had enough of the chills and ills of winter and the cold weather seems to have taken over our lives. It’s in all our conversations and seems all consuming. Recently, I heard someone mention that August was a season of its own and it struck a chord. August is often a difficult month for me, and for many of those in my inner circle. Sickness seems to just hang around and motivation flies out the window at its earliest convenience. I was an immediate convert to this idea of a new season, so I did a little investigating. Seems it’s not a new thing after all. 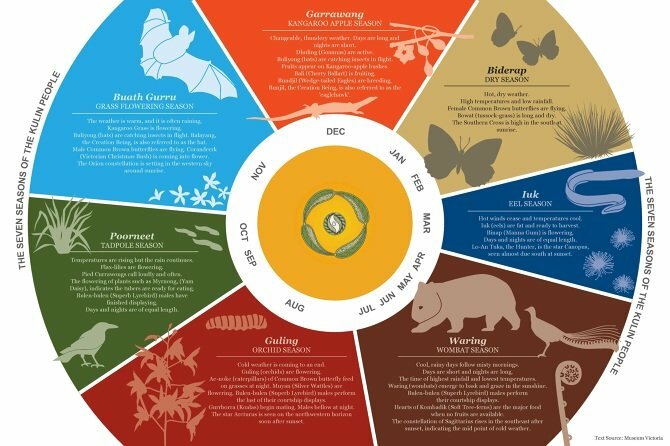 Across Australia there are many Indigenous calendars. Most have six or seven seasons, including that of the Kulin nation – the five Aboriginal language groups that make up what we know as Greater Melbourne and Central Victoria, including the Wurundjeri People. “The Kulin have a detailed local understanding of the seasons and the environment. It’s called Guling Orchid Season, and it is marked by orchids flowering, the silver wattle bursting into colour and male koalas bellowing at night. Poorneet Tadpole Season, (September and October) is when temperatures rise, rain continues and the pied currawongs call loudly. The days and nights are of equal length. Kangaroo-Apple Season, (December) is marked by its changeable, thundery weather, longer days and shorter nights. Biderap Dry Season, (January and February) has high temperatures and low rainfall. Iuk (Eel) Season, (March) is when the hot winds stop and the temperatures cool, while the manna gums flower and the days and nights are again equal in length. Waring Wombat Season, (April-July) has cool, rainy days and misty mornings, with our highest rainfall and lowest temperatures. Seven seasons seem to make a lot of sense. In my research, I stumbled across some notes from a workshop that was held in Warrandyte, in March 1994. The workshop was initiated by Alan Reid, now a renowned naturalist and environmental writer. He was interested in including Aboriginal knowledge of seasonal change together with local knowledge from regions of Australia, and had suggested the workshop to pool observations within the region to look for seasonal patterns. This seemed to be the catalyst for ongoing work by other naturalists into the seasonal calendars of the Melbourne area. Monitoring was undertaken by many birdwatchers, plant surveyors and others with an interest in documenting changes in local flora and fauna, and, later that year, an interim local calendar of six seasons for the middle Yarra region was launched. Some years later, more observations were added, and the calendar was adjusted. Personally, I don’t want to do without the word autumn as it conjures up so much colour and meaning, but having a local calendar that incorporates indigenous knowledge seems to fill in the gaps and paint a more complete picture of the world immediately around us. So, with a greater understanding from those that lived dependent on the rhythm of the seasons combined with the findings from the workshop in Warrandyte, perhaps we can all approach this next season a little wiser, be a little more prepared, and just maybe next winter won’t seem so long if we acknowledge Guling. The purpose of this column is to assist you in adopting the same philosophy which you are perfectly entitled to do, providing you understand the important difference between tax evasion and tax avoidance. Tax evasion is acting contrary to the law and incurs severe penalties, whereas tax avoidance involves working within the law to avoid paying more tax than you need to. So what do you need to understand in order to implement Kerry Packer’s advice? Make sure you claim all expenditure incurred in the tax year that is tax deductible. This will require you to keep either paper (invoices, receipts etc.) or electronic records that contain date of expenditure, description and amount. Bank statements and credit card statements may suffice if they contain sufficient identifying information. Alternatively download the ATO myDeductions App and use it to record your deduction records on to your mobile or tablet. This App is suitable for use by individuals and sole traders. Work related expenses totalling less than $300 do not require supporting documentation but you will be expected to have a reasonable basis for arriving at the amount you are claiming. This may apply for example when claiming laundry of uniforms or protective work clothing. Claiming all expenditures such as donations, work related expenses, business and investment related deductions etc. can be quite complicated, so give consideration to using the services of a registered tax agent whose fees and your travel time to visit are deductible. Your tax agent will also be able to advise you on the appropriate records you will need to claim the deductible component of motor vehicle, phone, computer, home office expenses, laundering of uniforms and protective clothing, self-education expenses and depreciable assets etc. We have probably all heard the saying “a bird in the hand is worth two in the bush”. This equally applies to tax by bringing forward deductions into the current year and reducing your tax liability for the current year rather than waiting a further 12 months or more before you claim the tax saving from the deduction. Deductible expenses such as insurance premiums should be timed to fall due in June rather than any other month of the year. The same goes for depreciable assets that are deductible such as computers, rental property depreciable contents, and particularly tools, plant and equipment and motor vehicles used in a business. If you donate to charities, school building funds etc. give a thought to making these donations in June rather than earlier in the year, reducing the time period between the cash outlay and the receipt of the tax deduction benefit. Timing benefits can also be accessed by delaying the receipt of income until July rather than having it paid to you in June. This strategy could be applied to timing the sale of investments that are likely to trigger a capital gain where there are no offsetting capital losses available. Wage and salary earners entitled to a year-end bonus may be able negotiate payment in the first pay period in July rather than the last pay period in June. Sole traders selling on credit could consider delaying invoicing for work done in June until early July. Example: A sole trader on an otherwise taxable income of $60,000 brought forward the purchase of an item of plant costing $15,000 from July to June which is fully tax deductible being under the $20,000 cap for a small business. She also delayed billing customers for work done in June until July 1 amounting to $6,000 thereby reducing her taxable income by $21,000 to $39,000. With tax levied at $0.34 per dollar in the range from $37,000 – $87,000 her tax saving and increased cash flow would amount to $7,560 including a low income tax offset of $415. Your homework is to Google “Super Co-Contribution” to discover whether you are eligible to receive your free gift.